What is holding you back from experiencing a faith journey in which you see new things, feel alive in doing God’s will, and meet exceptional people? Do you long for your life to be more than what it is now? Has God called you to take a leap of faith and answer his call to cross cultural adventures and ministry? What is holding you back? 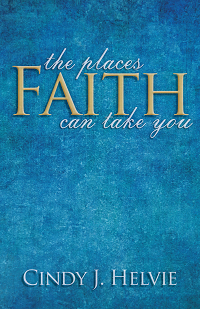 This book is contains stories of faith that will encourage your faith so you can experience your own faith journey. Learn how to face down fear and enter into a prayer relationship that can send you out on the most amazing journey that is your life with God. The author has served in cross cultural missions with her husband, Mike, for over twenty-two years in South Africa, Albania and Zambia. They are currently missionaries in residence at Indiana Wesleyan University. They are planning another overseas assignment. Cindy is an ordained minister, counselor, and registered nurse. She and Mike have been married thirty-four years and have two grown children and three grandsons. To order a copy, please send check or money order for $15 made out to Chapel Pike Wesleyan and earmarked “Helvie Support.” Be sure to include a note with your shipping address.